Charlie Gault had all the luck. Unfortunately, it wasn’t the good kind. It was looking like Lady Luck had quite a grudge against him. In fact, at this point merely crashing the multi-billion-dollar ship he had helped design would have felt like winning the lottery compared to his current dilemma. If only he were so lucky. 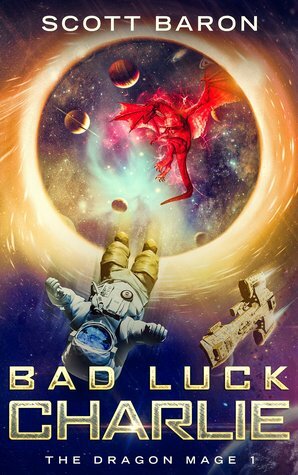 Things had started off all right––that is, until a freak wormhole unexpectedly swallowed his ship, leaving him stranded on an unknown planet far, far from home. With the crew’s lives at stake, Charlie had no choice but to stop his whining, put on his big boy pants, and step up to save them all, and much to his surprise, it actually looked like he might succeed. Of course, that was when things really went sideways in ways that made merely crashing on an uncharted planet seem like a walk in the park. Suddenly faced with alien space pirates, talking dragons, and something that seemed very much like magic, Charlie found himself adrift, feeling like a space age Robinson Crusoe––only his man Friday was a blue-skinned alien, and this wasn’t just a desert island. It was a whole new galaxy. “Starboard heat shield seven is gone!” Charlie called out as calmly as he could over the din of their ship more or less tearing apart. He was going to carry out his duties like a professional if it was the last thing he’d do, and the way things were going, it was starting to look like it might be. Rika Gaspari, his second-in-command began frantically throwing switches, inverting the power flows, her hands a blur of activity as she carried out her orders. The ship’s rattling lessened, but did not cease. “Sir? Won’t we need that?” Charlie asked as he struggled to keep the engines from redlining into critical and blowing them all to hell. “Not if we don’t survive atmospheric entry. First things first. Right now, getting down in one piece is the most important one,” the captain replied. Rika did as she was ordered. A moment later the crew felt the ever-present breeze of recirculating air that moved about them cease. It was something they were so familiar with that they didn’t even notice its presence until it was abruptly gone. “Copy that. Jamal, are you suited up?” the captain asked over internal comms. The chief of security and emergency services had geared up the moment things began to sway out of parameters, which was just before they were unceremoniously sucked through a massive wormhole and spat out Lord knew where. His foresight was a good thing. It was looking like things were about to get a whole lot worse. The ship bucked and tossed, its hull glowing bright orange as the edges of the strange world’s atmosphere pummeled it with brutal intensity. It was a rough ride in command. Captain Reynard knew the rest of his crew were being subjected to a vicious beating in their compartments. He just hoped they had strapped in. They launched with twenty-four living crew aboard, and he planned to keep it that way. The command module’s power flickered and dimmed. “Losing primary power,” Gaspari said. “I see it,” Charlie replied, already in motion, rushing from his seat to the door to the adjacent engineering compartment just off the bridge. His team in main engineering down below would keep the reactors powered up. It was his job to keep that power flowing to the controls during flight. Smoke greeted him as he manually opened the door with the backup access crank tucked into the wall panel. “We got a fire?” Reynard asked, sniffing the air. “Negative, Captain. Just some blown circuits and overloaded wires,” Charlie replied as he stuck his head in and surveyed the damage. The room was small, just row upon row of circuit racks and relays. A harness chair sat in front of a work bench, never before used. Of course, for the maiden flight of the ship, why would it have been. Without another word, he slid through the narrow gap he’d opened in the door and set to work. The blown circuits were the easiest to repair, and luckily the most vital as well. The smoldering wires nearby––while important––were not crucial to staying aloft. “Powering off navs and switching your panels to emergency reserve. Nobody touch anything until I say so. We’re already maxing the load,” he yelled out through the door. Melted circuits went flying, his nimble fingers quickly replacing them with the backups stored in neatly-arranged cases mounted to the wall nearby. A mere thirty seconds after he began, he called out to the others once more. Captain Reynard feathered the controls. The ship responded as well as could be expected given the circumstances. “We’re limping, but it should be enough,” she replied. “Believe me, the last place I want to be is stuck in here,” he replied, setting to work. He had just replaced the first of the failing wires when the ship bucked and slammed him into the wall, the emergency protocols sealing the re-powered door shut with him inside. He frantically clawed for the crank handle, but the turbulence was too much. Miraculously, he was thrown backwards––right into the harness chair. The back of the chair, that is. Gotta get strapped in, he realized with a desperate grunt as his body switched from weightless to crushing Gs as the ship lurched and dove. Charlie slammed into the ceiling with a rude crunch, held weightless a moment, hovering just out of reach of anything from which to push off, then was thrown to the floor, pinned by the G-force. The pressure relented for a moment, allowing him to breathe. Charlie ignored the pain racking his body and dragged himself into the harness chair and strapped in snugly, and not a moment too soon, as the ship flipped upside down, then dove in a tight spiral. Stuck in the memory foam chair, Charlie cried out, then fell silent as the pressure of the mounting G-force drove the blood from his head, rendering him unconscious. He wouldn’t remember the crash. But he would never forget the aftermath, nor the folly that had led up to it. A native Californian, Scott Baron was born in Hollywood, which he claims may be the reason for his off-kilter sense of humor. Before taking up residence in Venice Beach, he spent a few years studying abroad before settling into the film and television industry, where he has worked off and on for some time. Scott not only writes, but is also involved in indie film and theater both in the U.S. and abroad. Are you ready to discover new books and tasty food? I will be writing reviews of books and posting recipes that I have created! Hope you all enjoy! Click on picture above to get your own copy!